+ Break down the process of event enrollment, form submission, and administrative approval into a simple step-by-step sequence. + Create professional development activity catalogs that allow you to send activity requests through the required approval processes. 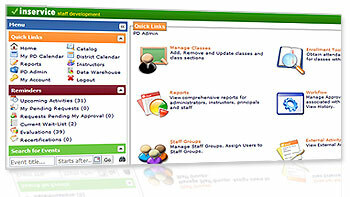 + Generate status reports to track teacher progress towards district goals and objectives, hours, and credits. 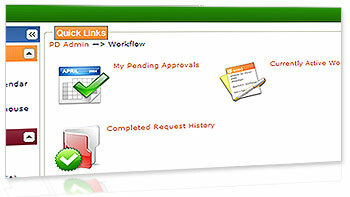 + Reduce paperwork with online tracking and approval. + Track internal and external activities and registration. 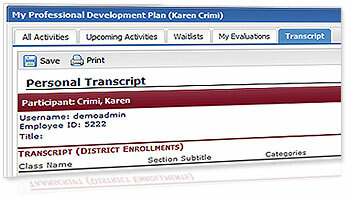 + Get district PD goals and objectives pre-loaded into the system. + Allow teachers to manage and track their own PD hours, credits, and goals. + Manage and allocate activities using district and building funds. + Ensure that your teachers complete goals required by the state. Webinar - Inservice: Overview of Professional Development Tracking: Looking at professional development tracking from a principal's perspective and showcasing teacher related tools for personal portfolio management. Webinar - Inservice for the Professional Development Administator: Managing district wide professional development, district activity catalogs, workflows and approvals processes, reporting, and more. Webinar - Inservice for Managing Professional Development: Addressing how teachers can manage their own professional development activities, hours, and credits. Visit our corporate website for more webinars and presenations. Manage multiple professional development workflows. Create a comprehensive PD course catalog. Obtain attendance and enrollment data. Define approval process and routing by district, school, or building. Notify teachers and approvers of status via customizable automatic emails. Approve or deny requests and add comments. View past and upcoming classes. Track credential information and expiration dates. Generate personal portfolios, credential and certification reporting, and mentoring plans. 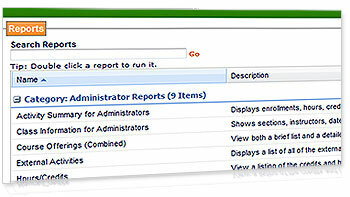 View reports by class or activity. View data by Events. 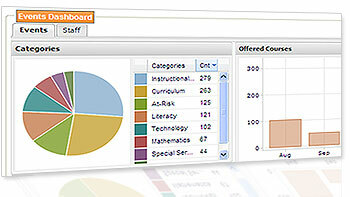 Drill down to view details by curriculum category, month, or course duration. Search events by title or data. View data by staff. Sort by grade level, departments, buildings, or groups you define.